Dry or dried molasses is a soil builing product made by spraying organic bits with liquid molasses. It is used to quickly stimulate microbes in the soil and give an indirect benefit of fertility. It also in many cases will run fire ants off the property. It should be used at 10 - 20 lbs. per 1000 sq ft. It can be beneficial on acerage at rates as low as 100 - 200 lbs. per acre. The sugar level in quality dry molasses should be 42% percent vs. the 38% and less that is on the market. The Stockade product contains the proper amount of sugar and also is a cane sugar base, which is the best. I’ve gotten several calls recently about how to tell the good molasses from the inferior ones that unfortunately are on the market. Here’s an update. Dry molasses isn’t dried molasses. It’s a grain residue carrier, such as bits of soy meal, that is sprayed and covered with liquid molasses. It’s an excellent carbon source that stimulates beneficial microorganisms. And, it repels fire ants. Apply to soil for landscaping at 20 lbs. per 1000 sq. ft. for ideal results. Farmers and ranchers can use it at much lower rates and still get acceptable results. As little as 100–200 lbs. per acre can be beneficial. Apply when the air and ground are dry to avoid creating a sticky mess. It cannot be mixed with water and sprayed. Liquid molasses is sweet syrup that is used as a food, but also as a soil amendment to feed and stimulate microorganisms. It is normally sprayed at 1 – 2 oz. per gallon of water. Like the dry molasses, it provides food for microorganisms and is a source of carbon, sulfur and potash. 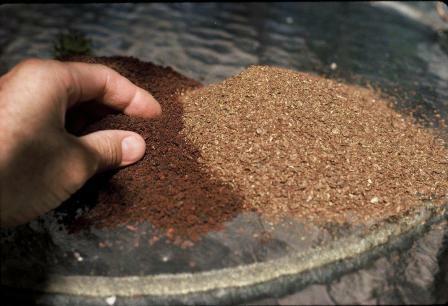 It is a quick source of energy for the soil life and microbes living the soil, or the compost pile, and will help chase fire ants away. Liquid molasses is used in sprays to help organic pest controls and as an ingredient in many organic fertilizers. It is also a major ingredient in liquid Garrett Juice. Sweet syrup that is a carbohydrate used as a soil amendment to feed and stimulate microorganisms. Contains sulfur, potash, and many trace minerals. Approximate analysis is 1-0-5. Molasses provides food for microorganisms and is a source of carbon, sulfur, and potash. It is a good, quick source of energy for the soil life and microbes in a compost pile, and will chase fire ants away. It is a carbon source and feeds beneficial microbes creating greater nature fertility. Liquid molasses is used in sprays and dry molasses is used as an ingredient in organic fertilizers. It contains sulfur, potash, and other trace minerals. Excellent foliar feeding material and can be mixed with other organic liquids. Use at 2-4 quarts/acre for soil application. For foliar application on broadleaf plants use 1 pint per acre. For grasses and grains still use 1 quart per acre. Blackstrap molasses is the best choice because it contains the sulfur and iron of the original material.